The forecast for the night of Wednesday, December 7 was frigid across the entire southwest. The highest nighttime temp we could find within driving distance was a cozy 23 in Lubbock, TX, so that’s where we headed. After we crossed the Rockies just to the east of Albuquerque, the scenery suddenly and steadily began to change. The sharp colors and angles of the Colorado Plateau faded into rolling hills and winter gray browns of the eastern great plains. The shrub covered deserts turned to sparse pine forests and bare deciduous trees in lines that revealed the path of streams along the road. A gray cloud cover reflected the yellow-gray grasses and the brown branches of winterized trees. The monochrome sky seemed to drink every bit of color from the earth except the bright yellow line on the side of the road that we followed for mile after mile after mile of mostly straight highway. 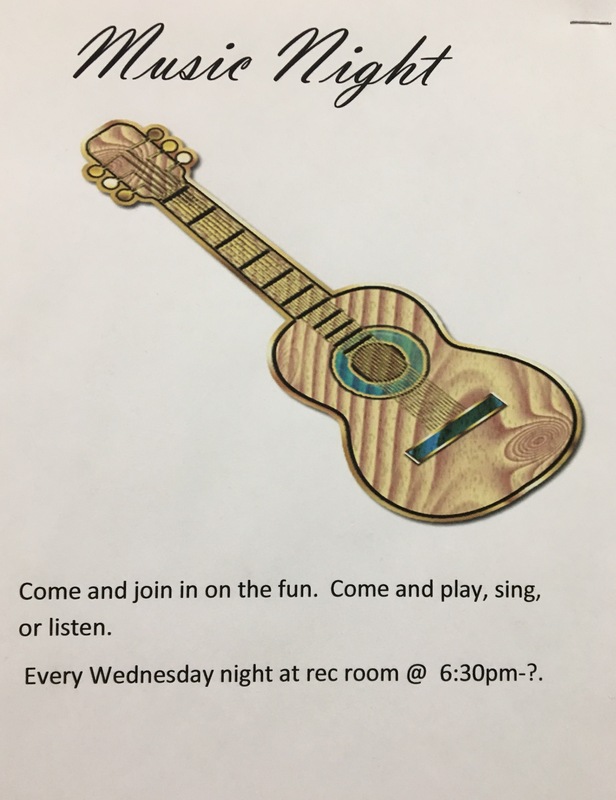 When I checked in to th e Twin Pine RV Park just outside of Lubbock, I noticed a flyer on a bulletin board inviting guests to join in a music night each Wednesday night. What luck – it was Wednesday! The girls and I rushed through dinner and grabbed my ukulele, and we hurried through the bitterly cold air back to the common room to join the fun. This is exactly the reason I brought my little uke. I had hoped for more opportunity to play it, but we are often living so near our quiet neighbors that I hate to disturb the peace. This opportunity to make music with other people had my senses buzzing in anticipation. It’s one of the things I miss most about being away from home. The group in the common room consisted of 7 people huddled around a round table, looking at binders of laminated, alphabetized songs with guitar chords. The ensemble included the campground owner leading on guitar, a camp host with only one hand playing a guitar holding the pic with a metal claw, and a young, local farmer who apparently joined them with his guitar on some occasions. The camp host’s wife and daughter were there to sing, as well as an older couple who live at the campground. We were expecting more gospel hymns that the girls and I could really join in with, but most of the selections were country songs about relationships with “the bottle” and being alone. We joined in despite the fact that we weren’t familiar with them, and I couldn’t help but laugh out loud at the sight of Sunny singing along with some of the printed lyrics she was reading. It was so delightful. At one point the young farmer said he needed to leave a bit early, so everyone quickly turned in their binders to the song “Do, Lord”. “This is our favorite one, so we have to sing it every time, before anyone leaves ” the campground owner explained to me with a big smile. We knew that one! The girls sang along and danced, and I couldn’t help smiling as we played through the song. I was able to capture this short voice memo to remember the experience…. Sunny also requested Leaving on a Jet Plane, which they actually had in their binder as well. The girls eventually got bored with all the country songs that they didn’t know and opted to stare at a muted TV playing nighttime dramas in the corner rather than participate, but I had such a great time. We left the drains on our gray water tanks open all night so that there wouldn’t be any water in them to freeze, but the frigid wind managed to freeze them open anyway. After we poured enough hot water down the tap to thaw them out the next afternoon, we unhooked and headed east again. We had an invitation to utilize RV hookups in the driveway of some Harding friends in Abilene, TX. 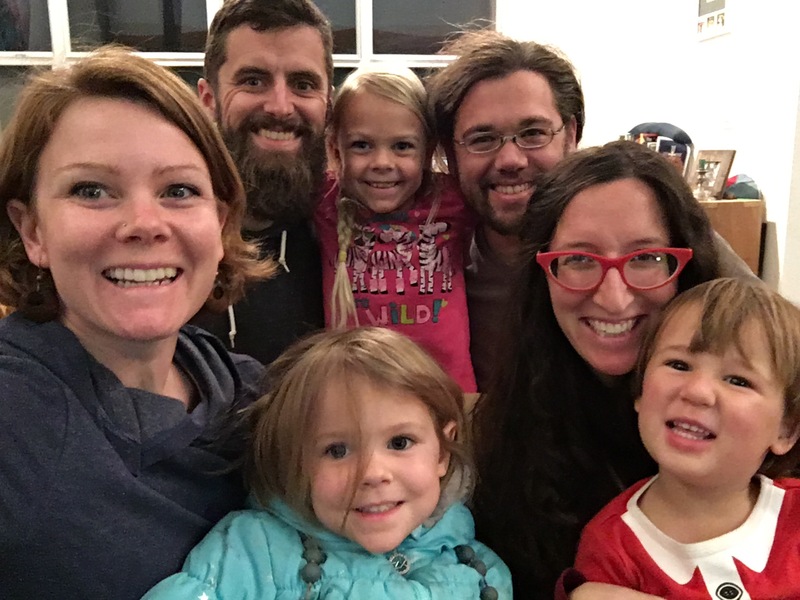 We hadn’t seen or talked to Jeremy & Kelly Elliott in about 12 years, but instantly reconnected and had a warm, cheerful night in their home. The fire in the belly of their wood burning stove in the middle of the living room created a wonderful atmosphere inside the house, but the real heart of their home seems to be the kitchen. We arrived just before dinner time. Kelly and their young son Silas were cutting biscuits out of the dough on the counter top, and Jeremy was slicing veggies for the large pot of potato soup on the stove top. We were served fresh meat and vegetables grown by the Elliotts and their friends for dinner, home-brewed beer, and home-roasted coffee in the morning. (Once they go commercial, we will be their first subscribers! Best coffee we’d had in months…) We even enjoyed fresh sausage with breakfast. 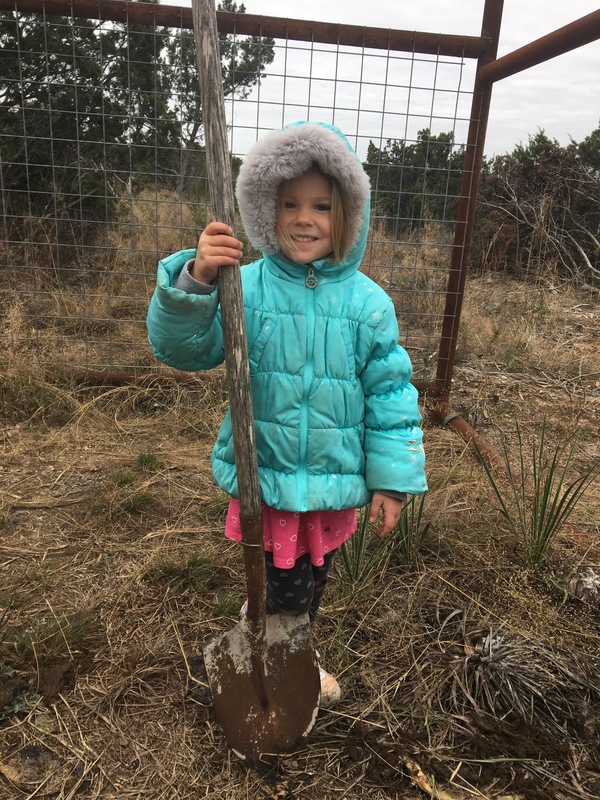 They’ve built a beautiful, cozy home on some acreage and have created a small farm on which to raise their family. 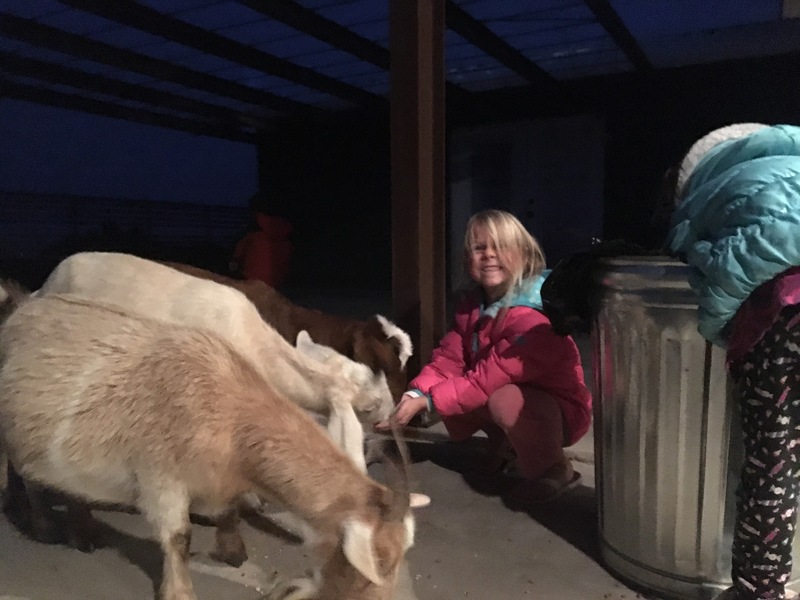 The girls enjoyed hand-feeding their goats that live on the back porch and seeing the baby pigs and turkey that they’re raising. Jeremy has become quite the farmer and hunter. During a discussion at dinner about how he learned to butcher his own meat, their son Silas calmly remarked, “We can teach you to kill any animal.” As much as this stoic comment from a 3 year old has us still giggling, their lifestyle was much to our culinary delight! 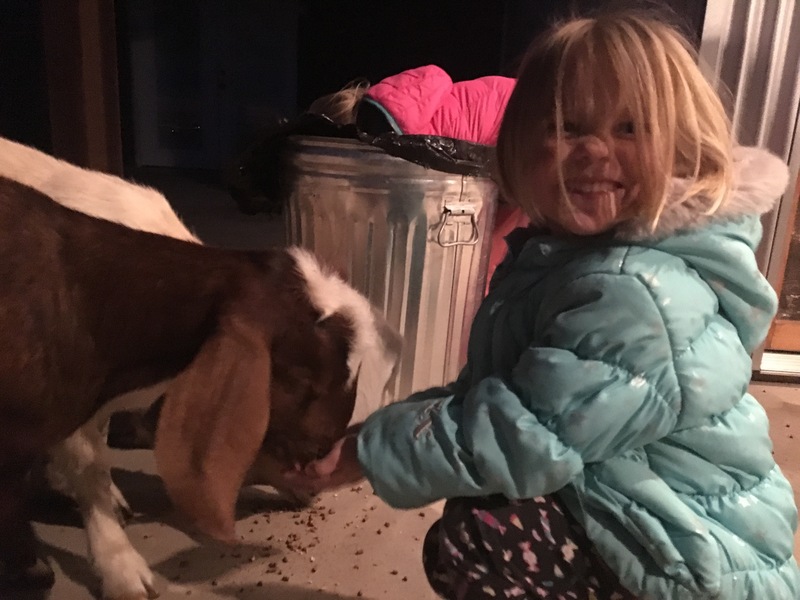 Coral giggling at the tickling goat lips on her fingers! Friendly farm animals are the best! 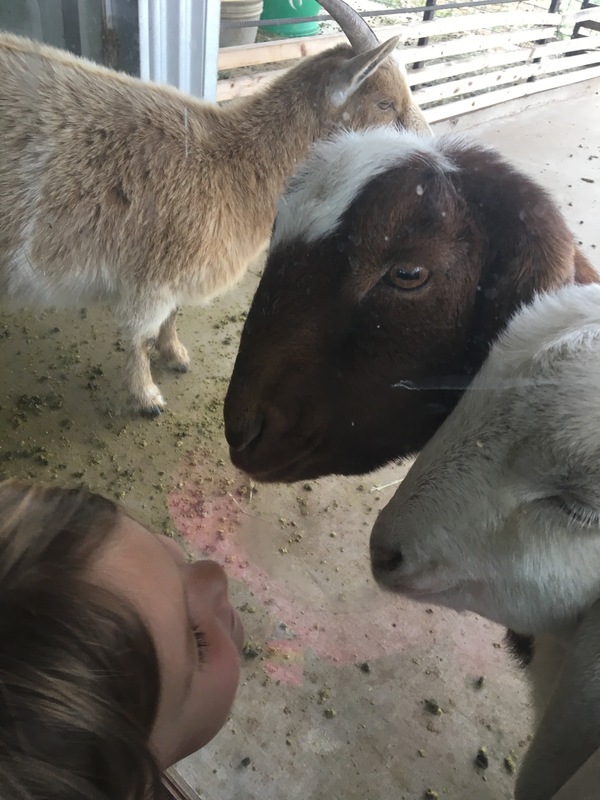 Coral telling the goats “Good Morning” through the window. Checking on various farm animals on a cold December morning. The only thing better than the food was the conversation. Since we only had 1 evening to make up for 12 years, we talked late into the night about everything from politics to faith to workplace dynamics to prayer. It was refreshing on so many levels. The FitzFam with our generous hosts in Abilene. The adapter that we needed to connect to their RV hookups hadn’t been used in several months, and when it was time to plug in it was nowhere to be found. Brad and I opened every storage area, each plastic bin, every junk drawer and crayon box and closet. We literally tore our house apart for an hour before finally giving up on finding the small, important, electrical accessory and just ran an extension cord through a space in the bottom compartment to power a space heater for the night. Even though the destination was initially about having convenient RV hookups, it ultimately ended up being a wonderful night’s stay for much more meaningful reasons.